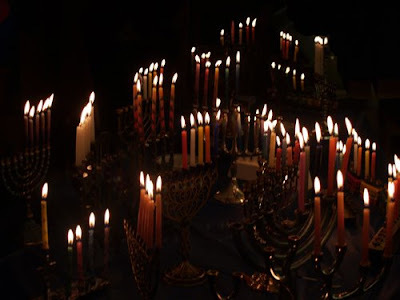 Because Chanukah usually occurs in December, it is sometimes thought of as the "Jewish Christmas." It isn't, of course. And yet it is fair to say that the reason for Chanukah's popularity -- especially in America, where it is the most widely observed Jewish holiday after Passover and Yom Kippur -- is precisely its proximity to Christmas. Chanukah used to be regarded as a minor half-holiday, cheerful but low-key. It has become something bigger and brighter in response to Christmas, which transforms each December into a brilliant winter festival of parties, decorations, and music. Attracted by the joy of the season, not wanting their children to feel left out of all the merriment and gift-giving, American Jews in the 20th century began to make much more of Chanukah than their grandparents ever had. Today Chanukah is well established as part of the annual "holiday season," complete with parties, decorations, and music of its own. Its enhanced status is a tribute both to the assimilating tug of America's majority culture and to the remarkable openness of that culture to Jewish customs and belief. Ironically, Chanukah was established to commemorate the very opposite of cultural assimilation. It dates back nearly 22 centuries, to the successful Jewish revolt against Antiochus IV, one of the line of Syrian-Greek monarchs who ruled the northern branch of Alexander the Great's collapsed empire. Alexander had been respectful of the Jews' monotheistic religion, but Antiochus was determined to impose Hellenism, with its pagan gods and its cult of the body, throughout his domains. When he met resistance in Judea, he made Judaism illegal.